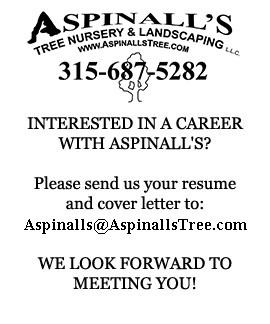 Interested in joining the Aspinall's crew? We also have positions open for a truck driver and a shop technician/mechanic. Please stop down if you would like to apply for these positions. Crew member should have experience in horticulture or landscaping. Emphasis is on efficiency and quality of workmanship and ability to work as part of a team. A willingness to work overtime as season requires and in adverse weather conditions is expected. Operation of related equipment such as sod cutters, line trimmers, power hedge trimmers, etc. is expected. Experience with larger equipment such as skid steers, back hoes, excavators is a plus. Candidate will typically be fit into the discipline of our business that best fits their skill set. -Candidate should have a valid Driver’s license. Seasonal and Full-year Positions are available. Crew member should have experience in hardscaping or masonry. Operation of related equipment such as skid steers, backhoe, demo saw, table saw, etc. is expected. -Valid Driver license required, CDL a plus. Hands on position working in the Nursery and Garden center areas. This position includes customer service and sales; as well as maintenance and display of plant material and hardgoods. Candidates should have a 2 year degree in Horticulture or equivalent experience, excellent communication skills. This position requires a willingness to work weekends or overtime as the season requires, work in adverse weather conditions, be able to lift 50 - 100 lbs. and be on their feet up to 95% of the workday. Candidate must be a hands-on, energetic and motivated individual with great communication skills, customer service experience and landscape install experience. Individual must be detail-oriented, perform well in a fast paced environment, and work well in a team atmosphere. Position duties will include supervision of crew, training, daily planning and scheduling of self and crew members, sourcing materials and equipment, deliveries, and maintenance of equipment. Applicant must be able to demonstrate knowledge and experience in Landscape Construction; as well as Hardscape Installations. -NY Certified Nursery Professional a plus.